August 19, 2011 by Alphageek in "alphageek", "review", "urbanspoon"
8/13/2011 We decided to eat here on exceptionally short notice. A friend from Texas called to say "hey, let's get dinner". Grabbing our Urbanspoon app for our android phones, we quickly settled in on a restaurant. We decided to give Black Bear Bistro a try. It got great write ups, and we did not leave disappointed. The location is easy to find, and we noticed that there is a lot of parking nearby. As we walked down to our requested seats outside, I noticed that there were several beer taps at the bar, serving an interesting assortment of beers from around the area. We quickly arrived at our seats, and were greeted by a knowledgeable waiter. I say knowledgeable because he must have spied my looking at the taps and asked us if we would like a beer. I enjoyed a New River Pale Ale that hit the spot just right on a night with great weather, at least when we arrived. 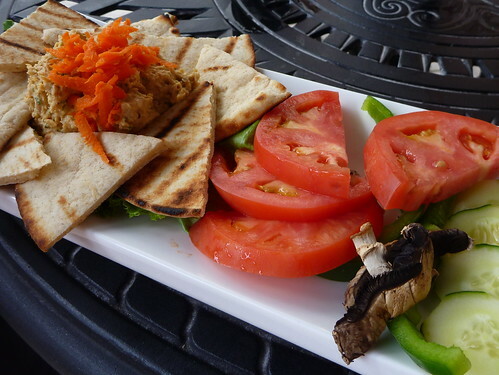 Below is the appetizer that we ordered, Hummus of the Moment. While a fairly straightforward dish, it was composed of fresh ingredients that you can easily see in the picture, so I won't ramble on about them. It was a great dish to enjoy with a drink before dinner. Black Bear Bistro takes great pride in their use of fresh and local ingredients, and this dish did not disappoint, tasting as if it were picked earlier that day. I settled on the Herb Salmon that you see below. 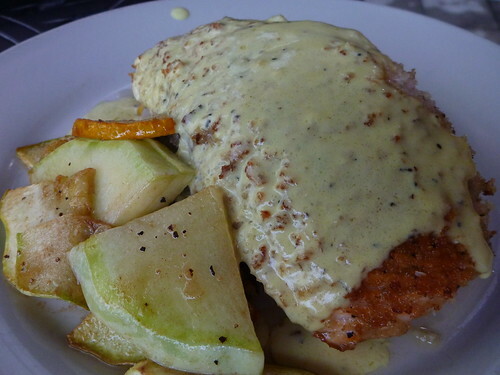 It was served pan fried with a light Dijon veloute sauce. I really don't know much about a veloute sauce, but it was really tasty. It was served on a bed of beans and rice that paired nicely with the sauce. Another person at the table ordered the Filet with Green Curry, which was a special the night we there. While I did not taste this dish, I can report that the dish was almost empty when it went back to the kitchen. 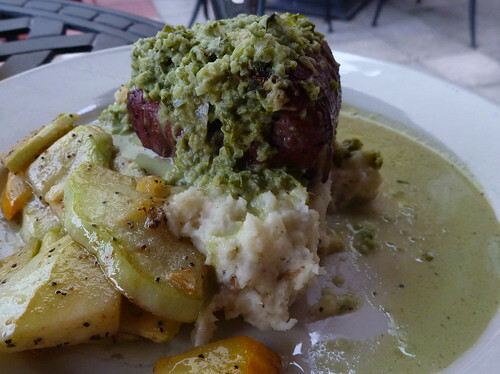 A quick glance at the filet mignon showed that the filet was served a perfect medium rare. 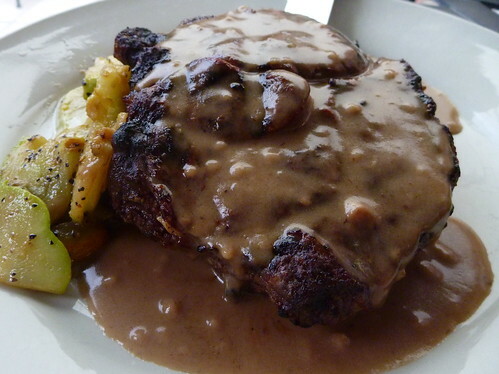 The Prime Rib with Jalapeno Sauce is pictured below. The dish had great potential, but the prime rib was overcooked from the requested medium. Not only over done, but more like the Alphageek would order a steak, which is well done. While the Alphageek might have been happy, he does agree it was overcooked. The sauce was still great, and this could be a great dish, but it just did not happen that day. We finished our meals just in time, because our outside dining led to the usual concern, which was a summertime storm. We requested to move somewhere inside, and the staff quickly adapted and found us some seats by the downstairs bar. Quick thinking is not something every establishment can pull off. A couple of final random items for your use. The restaurant has several vegan dishes on the menu, so you can check those out online if that is your thing. They also have a great selection of beers on tap. While not the many tens of beers that seems to be popular these days, they did have a good example of most major beer styles, and the sever was very knowledgeable about the beers.